Holy Week procession in Popayán, Colombia. Photo by Ronald Solarte. Intangible heritage, cultural expressions and their relationships with city planning rarely make it to ‘official’ conversations about cities. People recognize the importance of safeguarding culture in the design and policy making processes, but this interest is vague and lacks adequate instruments. Such is the case for the Holy Week Processions in Popayán, Colombia. This celebration, inscribed by the United Nations Educational, Scientific and Cultural Organization, UNESCO, in 2009 in their Intangible Heritage List, holds a special relationship with urban public spaces and social interaction in the city’s Historic Downtown. 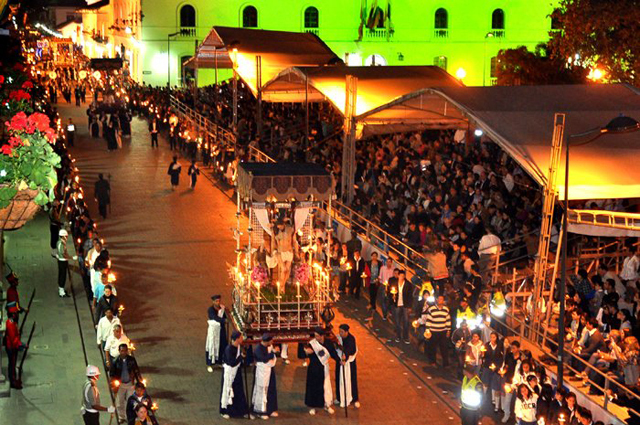 Watch the Holy Week Processions in Popayán. 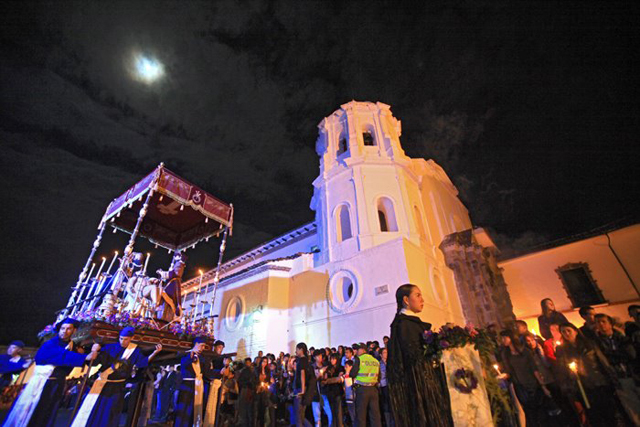 Popayán has held Holy Week Processions uninterrupted since 1556. The city was established 20 years earlier in 1536. Even though the Holy Week Processions go further back in time than city plans or the land use policies in Popayán, this cultural manifestation has not found a place in the municipal planning agenda. This wouldn’t be an issue if the cultural practices weren’t deeply tied to social interaction, public space and the economy of the whole city. The Processions have a tremendous impact on the local economy. A study conducted by the Permanent Pro Holy Week Board, which is the entity in charge of safeguarding and promoting cultural events, showed that for 2005 the impact reached 20 million US dollars. This amount represents one quarter of the yearly budget for the city in the same year. All of these resources were generated in only a week. Articulating intangible cultural heritage in the city planning agenda means not only to incorporate a unique and profitable scale economy, it also means to recognize the values that the community has developed over the course of four centuries. Local identity has been forged around the Processions, and acknowledging these social and cultural issues around a single event would eventually generate more inclusive and legitimate urban planning. Pursuing innovative and collaborative municipal urban planning schemes should be the goal of any public official in a small city like Popayán. With the second highest unemployment rate in the country, (a staggering 16,5% rate) the city must articulate cultural expressions that contribute to the well being of their citizens. Innovation has always proven to be successful when battling poverty and unemployment, and cultural-based city planning might just do the trick. In my thesis, “The analysis of incorporating intangible cultural heritage to city planning. A proposal for dialogue and inclusion mechanisms for the Holy Week Processions in Popayán,” I strongly defend this posture. To recognize and articulate cultural patterns and intangible heritage in the formal structures of spatial planning through dialogue between communities and planning officials seem a difficult task. And it certainly is. But it is a challenge that cannot be left unmet – not while culture and identity are challenged by technically-oriented urban development. Post by Juan Constain. Juan is a student at Universidad del Rosario in Bogotá, Colombia. He is currently an intern at MIT CoLab. For further information on the thesis please contact Juan directly at constain@mit.edu.